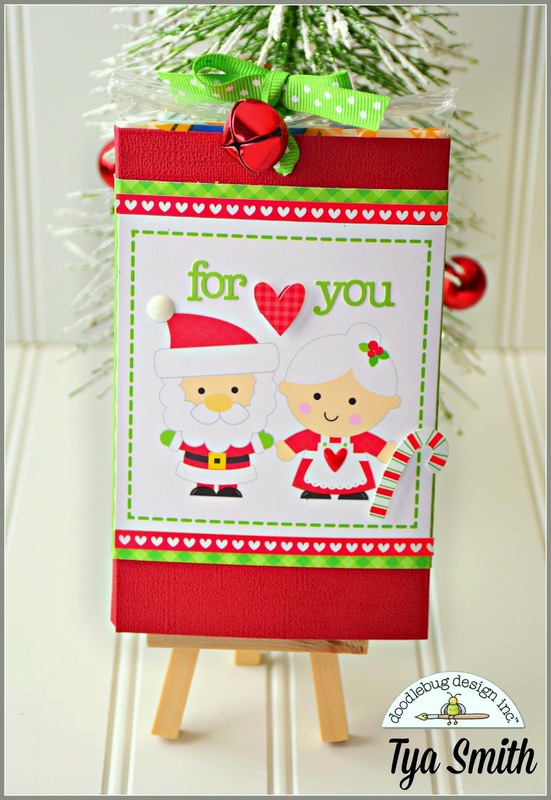 Hi Doodlebug friends -It's Tya here up on the blog today. 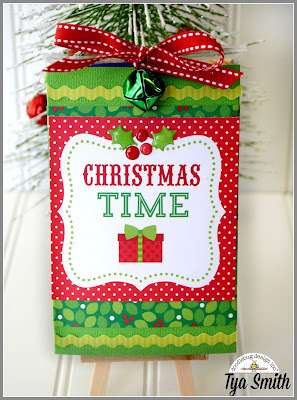 I can't believe that Christmas is just several weeks away! Where has 2015 gone? 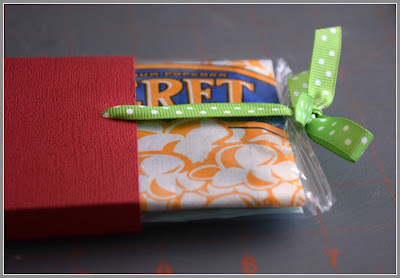 Every year I say that I am going to start my holiday planning early and this quick and easy neighbor gift that I have to show you today is simple enough that you can whip up a whole bunch of these little guys in an afternoon. 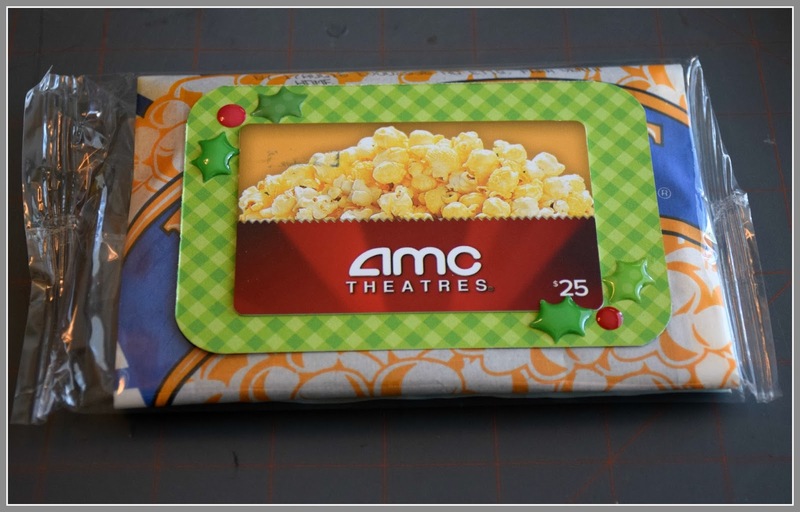 These boxes hold a package of microwave popcorn and then I added a gift card to the movies in there as well - such a fun and practical gift idea that everyone will love! I have included a tutorial to show you the steps that I used to make the boxes. 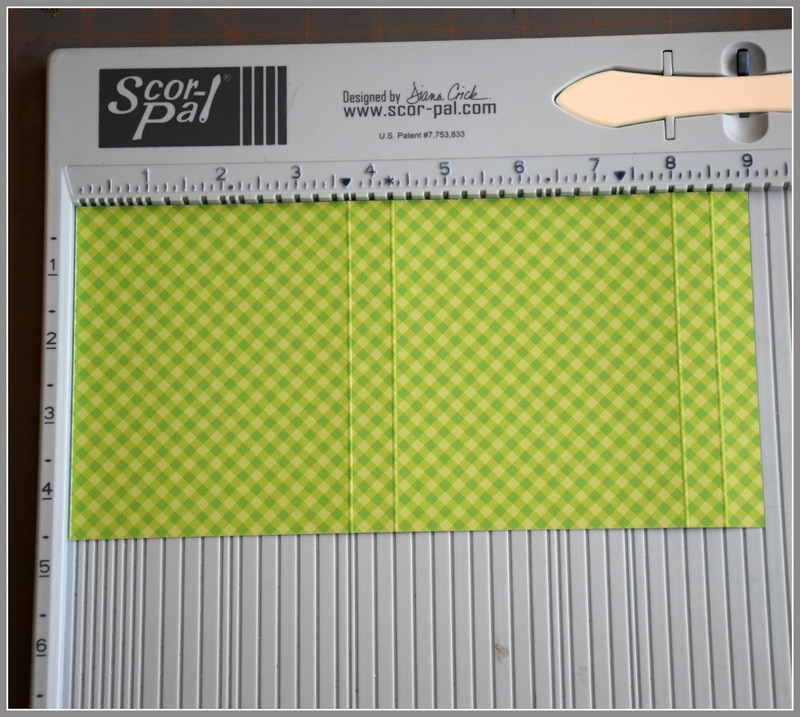 You will need a scoring tool or scoring blade, some sticky strip, a crop-a-dile or hole punch and some ribbon. 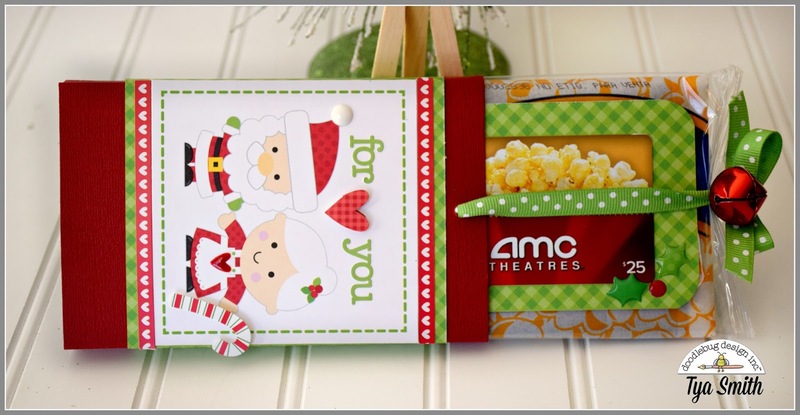 And of course some fun Doodlebug supplies to dress them up and the popcorn and gift card (if desired). 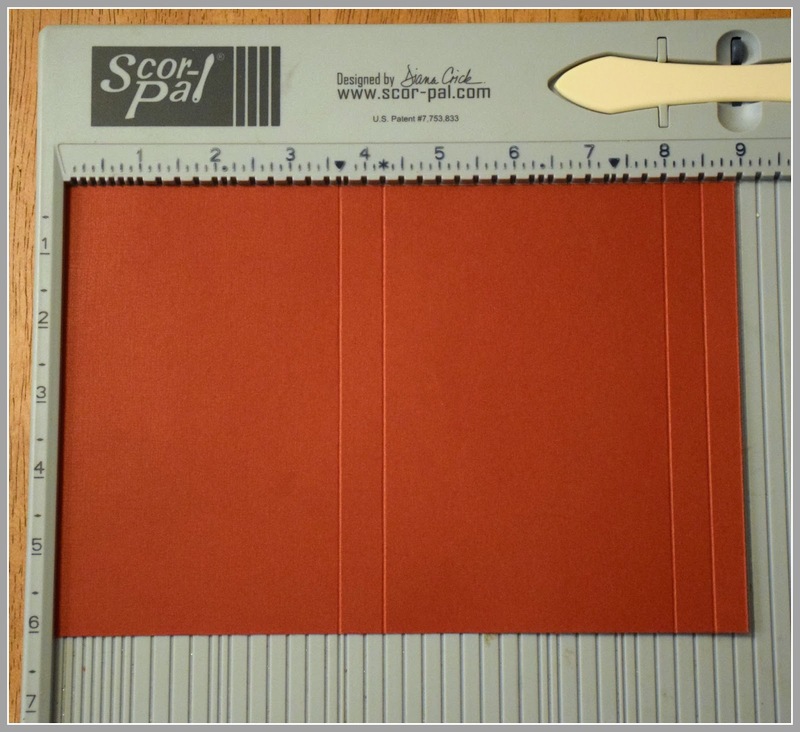 Take a 6x 9 inch piece of paper and on the 9 inch side score the paper at 3 3/4, 4 1/4 , 8 and 8 1/2 inches. 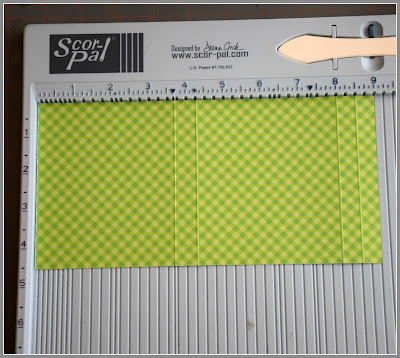 Fold the paper on the scored marks and add sticky strip on the edge as shown. 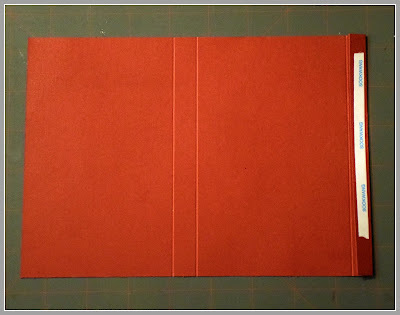 Fold the box up as shown. 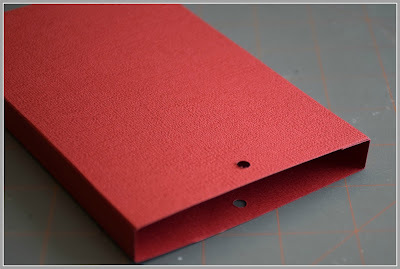 Using a hole punch, punch a hole about 1/4 an inch down from the top and in the middle. Squeeze the paper together and punch both sides at the same time. 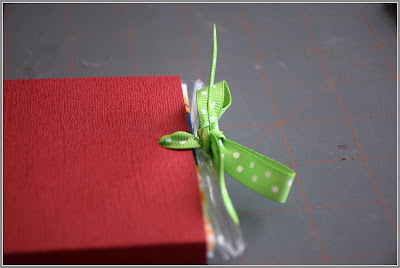 Take a piece of 24 inch ribbon and lace the 2 ends through the holes you punched. 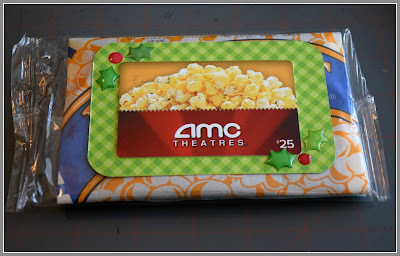 Add the gift card to the popcorn. Place the popcorn into the center of the ribbon and push the popcorn all the way down until it is covered. Tie a bow or knot at the end. 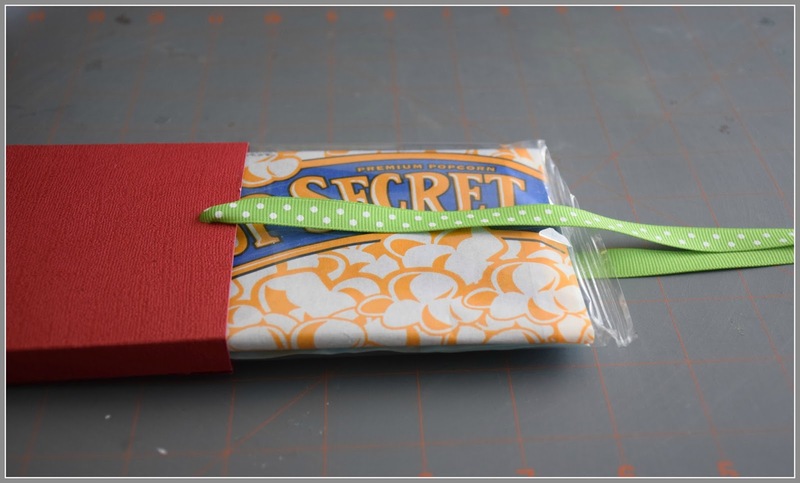 The fun thing about this package is the popcorn slides out of the box even with the bow still tied. It is super fun! 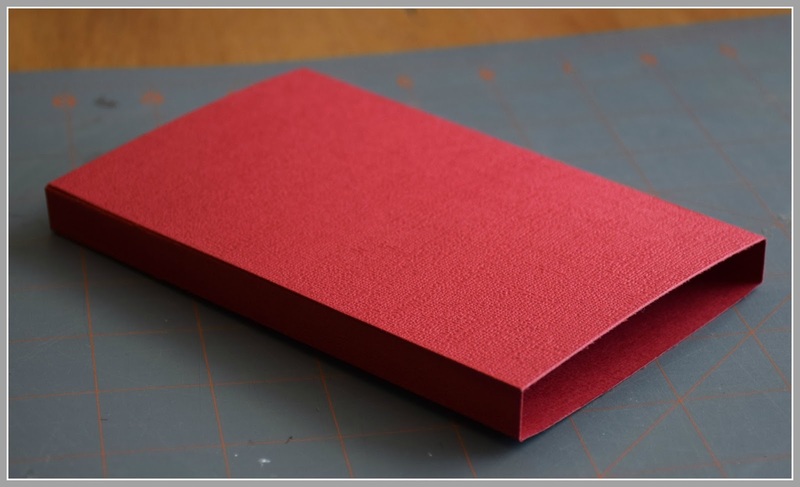 To add a belly band of pattern paper to the box, I took a piece of 4 1/2 x 9 inch paper and scored it again at 3 3/4 , 4 1/4 , 8 and 8 1/2 inches. 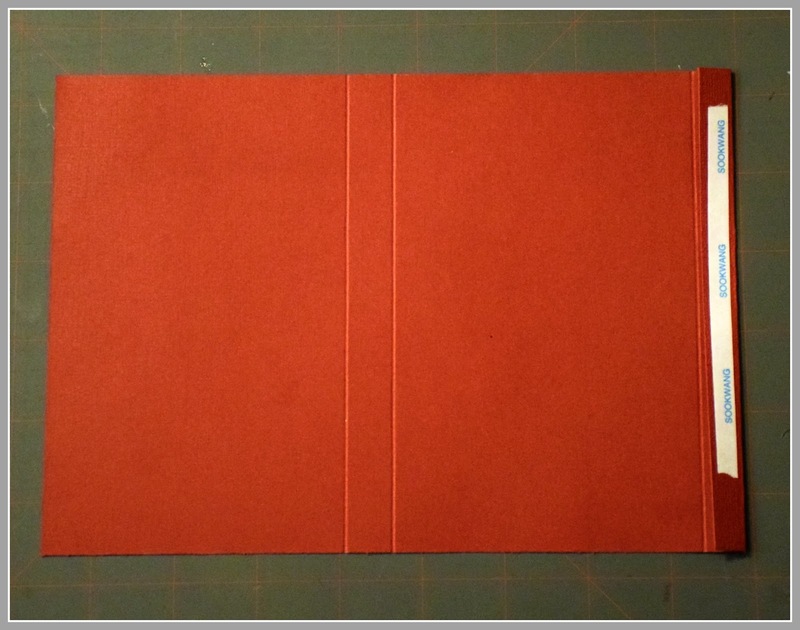 Add the sticky strip to the end like we did on the cover and wrap the pattern paper around the base. Step 8 - Have fun and decorate the covers! 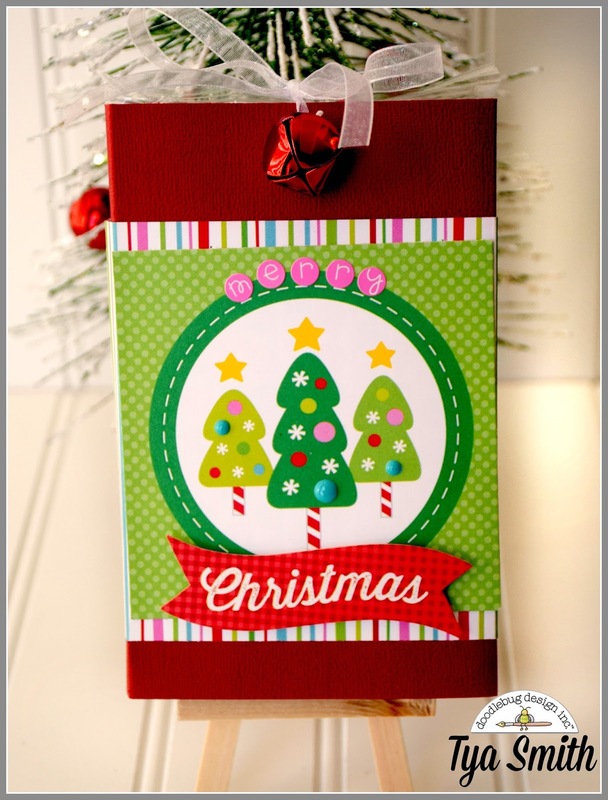 I used the cute 4x4 inch square papers for the bases. I then had fun adding Icon stickers, sprinkles, doodle sentiments, frills and sentiments from the This and That sticker sheet to dress them up. 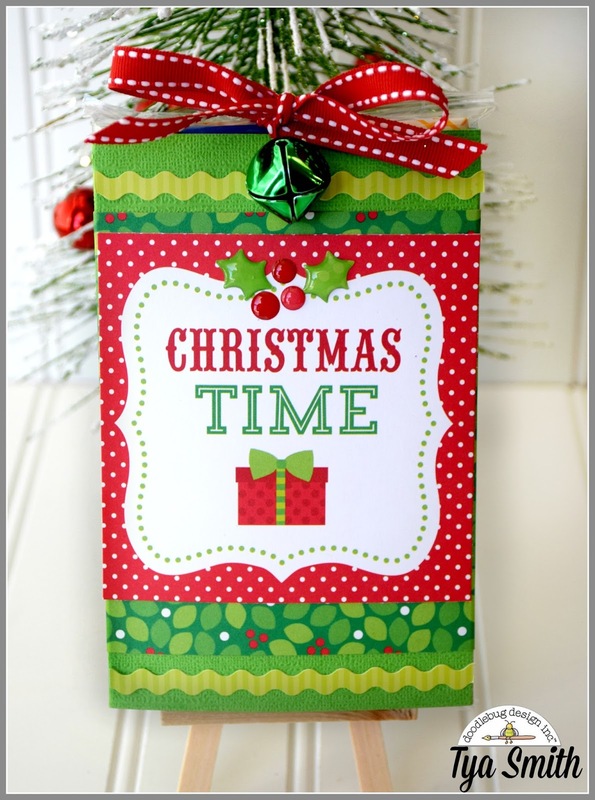 And what festive package would be complete without a jingle bell to top it off? Thanks so much for stopping by today! I hope that I have inspired you to try these out. 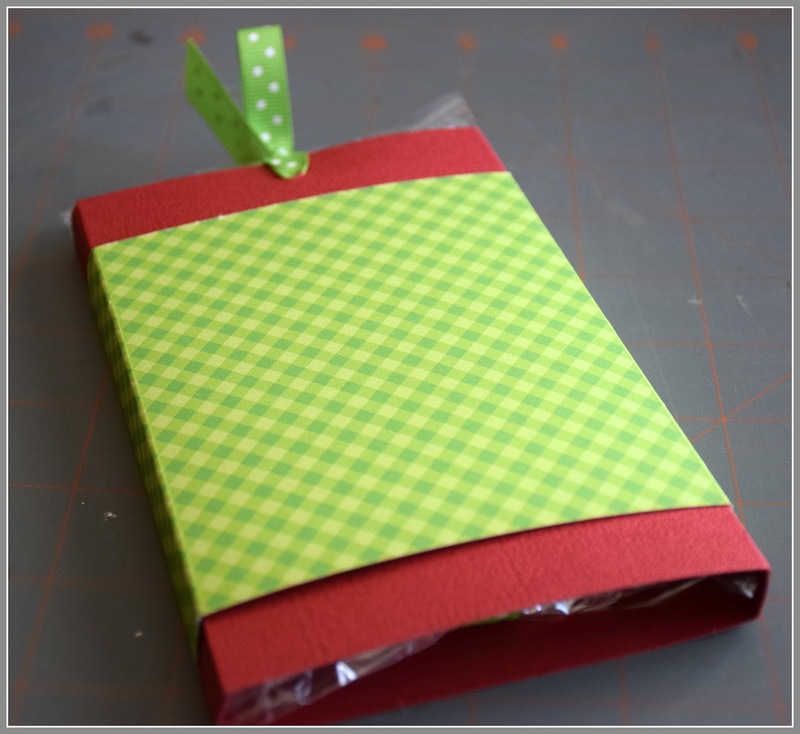 They are a great gift not only for neighbors, but co-workers and teachers would love these as well. Happy Holidays and Happy Crafting everyone! Fabulous!!! Liked and shared on facebook. Such an awesome idea Tya!!! Such a fun and creative idea! 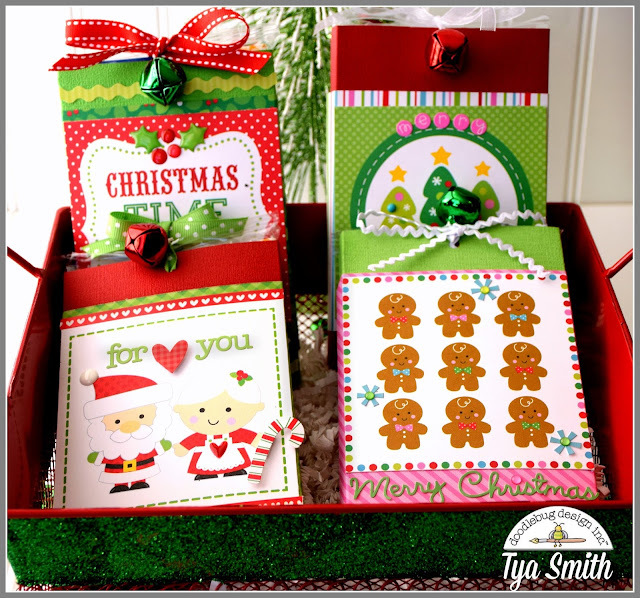 These will be perfect to have stashed away for those neighbor gifts, you never know who is going to pop over with some holiday goodies! Thanks for the tutorial too! Totally fun and cute! 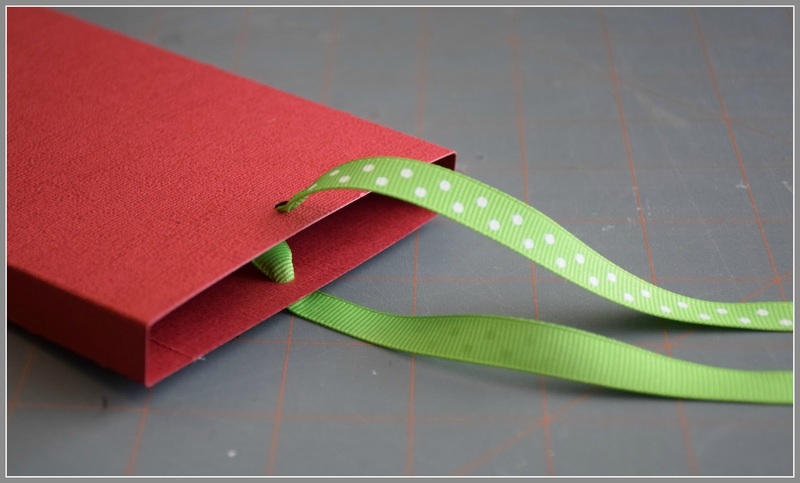 These are sweet gifts to pass out for just about anyone! Super cute gift card holders! Thanks for the inspiration. Super Fantastic Idea!!!! Love these TYA - so super fun and THANK YOU so much for showing how to make them!!! 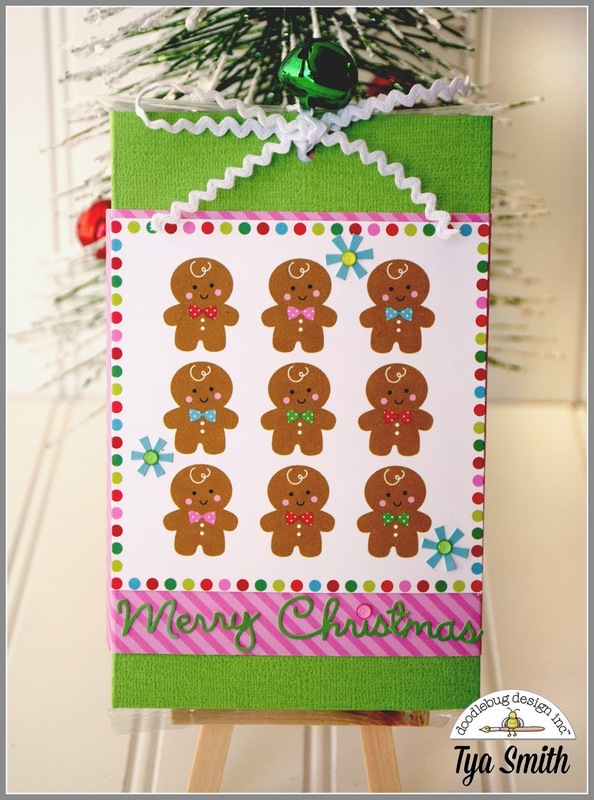 I appreciate you and all the designers for Doodlebug - the talent just oozes from you all!!! I TOTALLY follow you on Instagram!!! 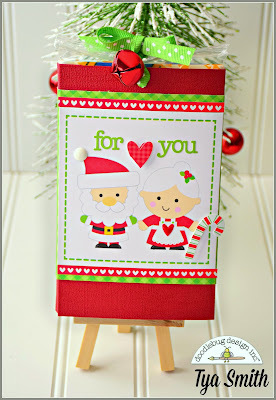 Pinned this cuteness to my Doodlebug - Christmas board because it is such an awesome idea!!! 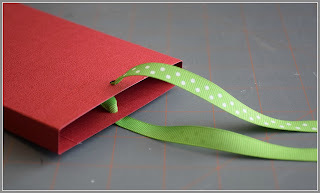 Shared this great idea and how - tos with my friends on Facebook!!! Thanks for so much fun! !